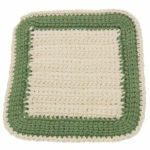 Checkerboard Potholder -- A free Crochet pattern from Julie A Bolduc. This crocheted potholders is done completely in single crochet. It uses 2 different colors that are carried throughout the pattern. It is done in the tapestry crochet technique. This is a light duty potholder and not meant for use with super hot oven pans. It is meant for handles on the top of a stove that are really not that hot.